For the past week, we’ve watched as forest fires rage across the BC interior, covering much of the province in a thick haze of smoke. As of Sunday, flights were being canceled due to low visibility (less than 1 km), and extreme weather alerts became commonplace. As the fires continue, people are being asked to stay indoors – that is, if they haven’t already been evacuated. Over 500 fires still burn, and more than 2,800 people have evacuated their homes with over 1000 more on notice. The air quality in much of BC is bad right now, worse than that of Beijing or Mumbai, both cities known for their poor track record on clean air. 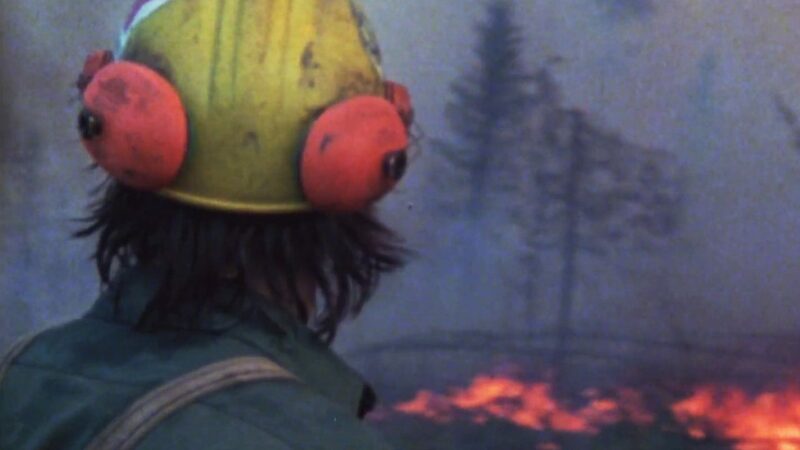 To better understand the force of these fires, and better appreciate the bravery of those fighting them, we’ve selected two films from our collection that bring you right into the heart of BC forest fires. This documentary from the mid-80s is a straight-up man vs. nature film cleverly disguised as a close look at forest fires. From early detection to raging fire, we tag along as various staff members of Canada’s national parks show us how they do what they do. Sometimes, forest fires are necessary – they help with soil enrichment and creating new environments for wild life – but often things get out of hand. With lightning storms raging across some of these parks on a daily basis, dry season often equals disaster. The film takes us through several wildfires, from Banff to Wood Buffalo, on the border of Alberta and the North West Territories. There’s some incredible footage in this doc. It’s crazy to watch the archival material of the two men heading into a forest fire with two hoses siphoning water from the lake. And having to prime the hoses. This is a short film with a lot to offer. In just under ten minutes, it takes us deep into a forest fire, makes a strong statement about how we treat our environment, and features some incredible aerial footage. Completely without dialogue, as long as you don’t count the radio exchanges, this documentary shows us what goes into fighting forest fires. There are men who get right into the thick of things, determined to thin out the trees and stop the fires. We watch one guy with a chainsaw as he watches overhead to make sure a flaming tree doesn’t fall on him while he works. This is some serious bravery. Over the course of this film, we watch almost an entire mountainside dissolve into ash. Mother Nature is a force, and this is one of those films that won’t let you forget it.